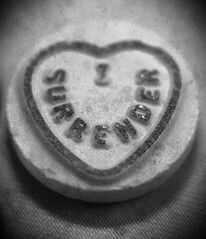 Total Surrender, a photo by thehutch on Flickr. A word that is less fashionable these days but was one that I heard regularly in Church as a teenager.I listened to one hymn on a regular basis….”I surrender all” sung after the sermon as many an old voice warbled it, yet something of the power of God would be evident as people determined to live ‘completely for Christ”. These days, it feels like surrender is less a refrain, rather the ‘life coaching impress’ of success, achievement and striving as we unlock potential, achieve our dreams and live lives of great accomplishment. The disparity of these 2 worlds is very evident – if I had to choose between them it would be the former, for this is where the greatest fruitfulness is seen. However, I often find myself in the latter place. Each day is a choice, on this day, “I surrender”.